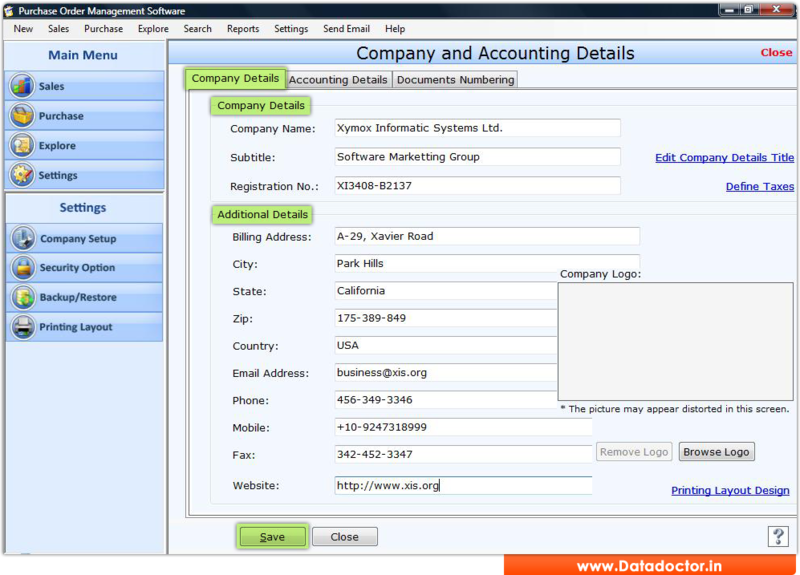 Do you want to manage your business sales and purchase accounting details at one place? Use Purchase Order business software that creates and manages business sales and purchase order details. Purchase order organizer application is useful for all companies and organization to create process and track business sales/purchase order details. Advance Purchase order database management utility is fully capable to manage Company details, Client and Vendor information, Sales/Purchase order reports and other similar purchase order details. Professional PO manager tool generates various sales and purchase order reports including Quote report, Delivery order report, Invoice report, Purchase order report, Purchase delivery report and other item transaction report for total calculation of product sales and purchase order. Purchase order software provides password functionality that prevents unauthorized users to access confidential sales/purchase order details of any business. Sales and Purchase order program provides graphical user interface, so that user can easily understand software features and operate it without knowing any prior accounting skills and training. » Creates and manages business sales and purchase order details. » Provide password protected facility that prevents unauthorized users to access crucial sales and purchase order records. » You can easily search sales and purchase records with in minimal time period with its advance data search option. » Provide data backup and restore facility so that any accounting user can easily restore sales and purchase database records for further reference or data failure reasons. » Purchase order management software is useful for business manager, accountant and other invoicing user to manage sales/purchase details.